automatic transmissions and power steering systems. incredible sub-micron level stopping the "chain reaction of wear". 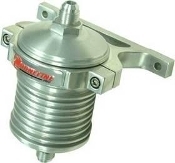 for automatic transmissions and power steering systems. your service cycle with the use of the Magnefine filter. according to Sayles and Macpherson. long lasting durability. Filter media and magnet is replaceable! the Performance Edition Magnefine has a replaceable filter catrige and magnet, the filter will last a lifetime. no need to replace the filter housing. magnet, stops the wear and break down of the stabilizers.